Fanny van de Grift Osbourne, born in Indiana in 1840, had big dreams, but put them aside to follow her shiftless husband, Sam Osbourne --- first to Nevada, then on to California --- in an effort to help him realize his “get-rich-quick” schemes that never materialized. Even with her baby daughter, Belle, in tow, loyal wife and intrepid traveler Fanny followed her husband out west in a time when westbound travel wasn’t always safe for women and children. It didn’t take her long to discover that not only are his plans for financial success questionable, but his fidelity is also suspect. With each passing year of their marriage, Sam began to be less concerned with his marital status and keeping up the appearances. Back within the confines of home base in San Francisco, Fanny tried to maintain a stable home life, “held her head high, pretending her husband’s philandering no longer hurt... In fact, every betrayal she discovered was a humiliating wound.” But after each duplicitous episode, there would be reconciliation. Two sons, Sam (who later changed his name to Lloyd) and Hervey, followed in due course. But even with three children to consider, Fanny knew marriage to Sam was not going to work. Fanny had long put aside her aspirations for her husband and children, and now felt the time was right to go abroad, not only for her artistic endeavors but also to expand the children’s horizons. First stop would be Antwerp, where Belle and Fanny began taking art instruction and a move to Paris, the artistic center of the world, was inevitable. But as soon as their lives started to form to a creative routine, tragedy struck, and Fanny and her children found themselves retreating to the French countryside. While staying at a rustic retreat in the town of Grez, Fanny meets a cousin to aspiring writer Robert Louis Stevenson, who makes the introduction to the young man who was then still working as a humble attorney in his native Scotland. Although Stevenson, or R.L.S., as he was often referred to, was immediately smitten despite the age difference (Osbourne was over 10 years older than him), Fanny, still reeling over the loss of her son, needed a little time to get to know the young writer. "UNDER THE WIDE AND STARRY SKY is another engrossing addition to the canon of the recent 'women behind the powerful, artistic men' historical novels we’ve seen lately, including Horan’s own LOVING FRANK, as well as THE PARIS WIFE and Z: A Novel of Zelda Fitzgerald." In due course, the attraction began to deepen and flourish. Before long, “she felt herself softening. Over the years she had made a near art of listening to men, no matter how boring; she perfected the interested gaze. But Louis was never boring; he was an extraordinary talker. And he listened to her --- closely enough that after a time he seemed to be reading her mind, anticipating what she would say next. They came from entirely different worlds yet shared a surprising number of common experiences.” And soon enough, the pair knew they were in love and had to be together. But the path of true love never runs smoothly. Fanny had to return to America and get Sam to agree to a divorce, and Stevenson had to convince his stern parents to accept his new career as a writer, as well as his soon-to-be wife, an American divorcee with two children. Add to that the writer’s weak constitution; he was constantly plagued by lung ailments that would mar the rest of his life. Much of their time together would be spent seeking out warmer climes for him to breathe easier. Stevenson often credited his wife with keeping him alive, quite literally. After being granted her divorce and a close call with Stevenson’s health, the pair finally married and began their lives together, which from that point forward meant a nomadic existence. They start with a visit to his parents’ home in Edinburgh, where Fanny wins over the formidable elder Stevensons with her charm and utter devotion to their son. They can clearly see she is mindful of his health as they have been. Under advice of doctors, Fanny and Louis relocate to Davos, Switzerland, hearing the Alpine air would help his lung ailments: “The truth was, Louis’s cruel illnesses whipped around their lives, pushed them toward places they didn’t want to go, and pulled them out of places they loved.” In between times of serious illness, Stevenson did manage to get a good deal of writing done, aided and sustained by the unwavering support of his loving wife. Can two creative types co-exist in a marriage, or does someone always have to take a backseat to the other? In her first outing, LOVING FRANK, Nancy Horan touched on this very topic, as she chronicled the life of Mamah Borthwick, wife of Frank Lloyd Wright, a formidable artist in her own right. 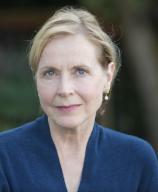 That novel opened up the private world and marriage of the two intensely private figures. In her latest book, she once again meticulously shows, through exhaustive research, the width and breadth of a complex marriage, in a story that proves enlightening as well as entertaining. Although it is a portrait of the writer and his wife/muse, it goes much deeper than that. It’s more about the marriage than the work. 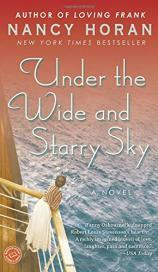 UNDER THE WIDE AND STARRY SKY is another engrossing addition to the canon of the recent “women behind the powerful, artistic men” historical novels we’ve seen lately, including Horan’s own LOVING FRANK, as well as THE PARIS WIFE and Z: A Novel of Zelda Fitzgerald.